There are plenty “Top 50” WordPress tricks listicles, this is not one. Maybe. From my own banging on WordPress since 2005 comes a collection of frequently used techniques, plugins, and sleight of hand put into play for educational sites. No code is touched in this production. (1) Thank you #pressedconf19 I reach back to my formative screen time (TV) for David Letterman's "Stupid Pet Tricks". This site includes more details and examples than could possibly fit into a tweet. If they are your thing, all the tweets in this presentation are packaged up neatly as a Twitter Moment. See also Tom Woodward’s #PressEdConf19 presentation for some WordPress CSS trickery. (14) Finally, we are required to say that no animals were harmed in the making of this #PressEdConf19 presentation. 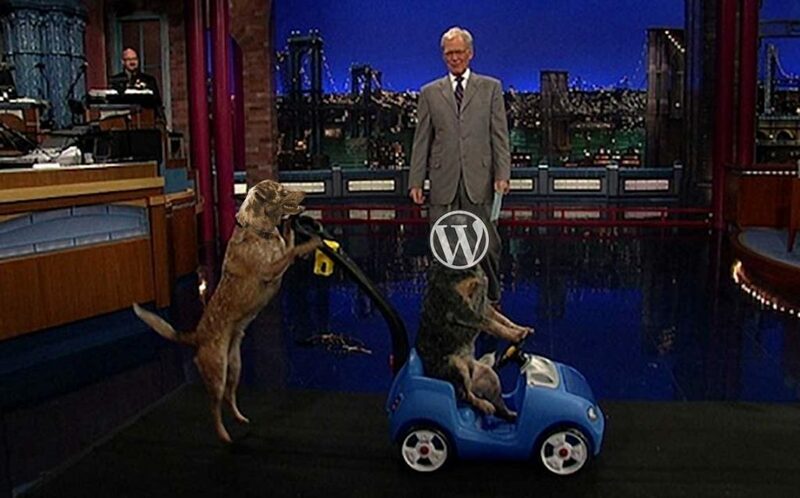 Image credits: Modification of one still shot of an episode of David Letterman’s Stupid Pet Tricks, found at A Letter to My Dog’s post Rouger and Rogue On David Letterman’s Stupid Pet Tricks with WordPress logo placed on one dog and Felix’s head on another.